A big orange figure? Bet that's the last time we review something like that this week! 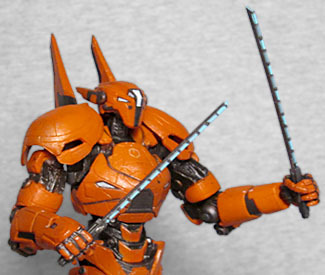 Hey, look, Pacific Rim 2 has a lady-bot! Well, technically I guess they're all lady-bots, since Jaegers work like ships, and are referred to as "she" no matter what (although, in real life, that practice is dying out, with most boats now just referred to as "it" by everyone who's not some kind of total obsessive weirdo), but there's a difference between simply calling a 252'-tall, 1,628-ton robot feminine and it actually looking that way, right? I mean, if Coyote Tango and Horizon Brave are both "shes," then it's good to know the butch/femme spectrum has survived the apocalypse. Like her official description says, with her ultra-light frame and hyper-tensile muscle strands, Saber Athena is "mechrobatic," not a brawler. Saber Athena is clearly built for speed. Although her proportions are very much like Gipsy Avenger's - long legs, thin waist, all that. Her outer casing is more smooth and rounded, rather than square or angular. She has massive shoulder pads, and two pointed "wings" sticking up off the backs of her shoulders. The little flares on her calves call to mind the winged sandals of Mercury, and let's give a small round of applause to the movie's designers for having the self-restraint to not give her high-heeled feet, trusting that there was already enough visual indication that this was supposed to be a feminine mech. Also, nice job making her hips be wider than her chest, so it's not just "lol bewbs means gurl." The head is long and flat, with wings over the ears that point backwards and two slits on the sides of the cockpit that end up looking like eyes, thanks to their placement. The shape of the head is quite unique, longer than it is tall, even if you count the "jaw" portion that sticks down lower than the rest. 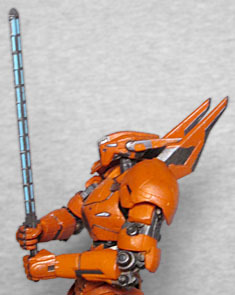 Most of the Jaegers had rather drab colorschemes, with only Crimson Typhoon breaking out of the cool half of the color wheel. 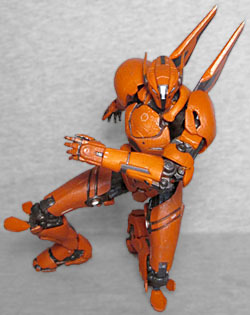 Saber Athena, meanwhile, is a bright orange, really drawing attention. What is she, sponsored by the Coast Guard? The internal workings are dark metallic grey, which makes a strong contrast. Her insignia are printed in yellow, and the various energy ports on her body are light. My Gipsy had some issues with the articulation, but they're better on Saber. She has most of the same joints - ankles, knees, hips, torso, wrists, elbows, biceps, shoulders, and neck - but while her chest joint is still a little wobblier than we're used to, her legs are fine. She still has those nifty new hip joints Gipsy sported, and her shoulder pads are on regular ball-and-socket joints, but the knees appear to be single-hinged, instead of double. Or, if they are double-hinged, I for the life of me cannot get the upper half of the hinge on either leg to move even a little. That's fine by me, it makes her stand securely and she's still plenty poseable. The figure's head doesn't break the 7½" mark, but her back-fins take her up over 8⅛". This figure doesn't get a huge onslaught of accessories, but she does get ones that matter. First, there are her Ionic Twinblades, the two short swords that are her go-to weapon. In the movie, they store in her back (or, more accurately, she just seems to reach behind her back and pull them out of hammerspace), but that doesn't happen here. The swords can also be fused together to form a singular overcharge sword, which this toy handles by just giving her a separate single sword. Smart move, since the movie version somehow ends up larger than the sum of its parts. The single sword's handle is bigger than the Twinblades', so her gripping hands have to be sized to accommodate it, meaning she has trouble holding the more slender blades; to fix that, just angle them in the hand slightly, and they'll fit tight. The gripping hands and the relaxed hands swap out easily at the wrist. 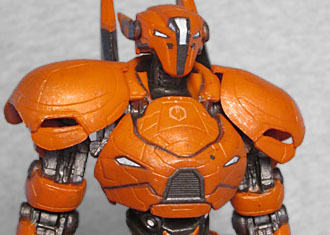 Gipsy Avenger looks like her ancestor, but Saber Athena has a design that's fully unique in the world of Pacific Rim. 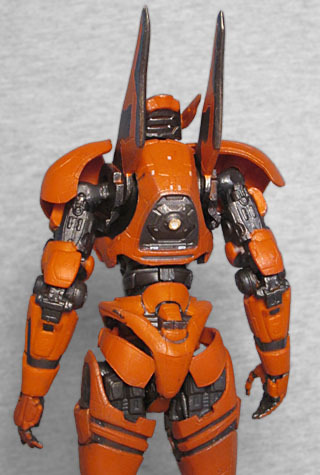 The sequel suffered a bit from not having really distinct, memorable Jaegers (there's no Cherno Alpha-level zaniness in Uprising), but with her bright colors and unusual design, this one stands out. DST sent us this figure for review, but the entire Pacific Rim: Uprising line is available now at your local comicshop or online.